Will we ever have a full day of school?!? Once again, due to the delayed opening — we will be running on a modified schedule today. Be sure to check with your TA teachers for class and lunch times. And remember — there is NO Wolf Time today, so please proceed directly to your 1st period class following the Morning Announcements. Thanks again, polar vortex!! And now it’s time for WOLF PACK PRIDE! There are a lot of AMAZING students here at WMS. And you deserve to be recognized! 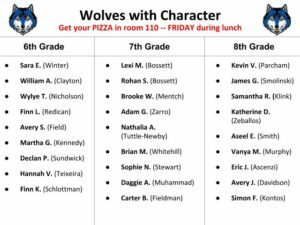 Teachers from every grade and every team have identified a distinguished group of students to receive this month’s Wolves With Character Award — for demonstrating outstanding “_______” in their daily lives. Just take a look at the screen to see all the deserving honorees from the 6th, 7th, and 8th grades. Congratulations, wolves with character!! [clap]. Be sure to stop by room 110 during your grade-level lunch on FRIDAY — you’ve earned yourself some free pizza! One more thing — listen up WRESTLERS! Please report to the WMS clinic IMMEDIATELY following the announcements for your weigh-in. Again, all wrestlers MUST get weighed-in this morning to compete this afternoon. See Mr. Mencarini with any questions. And here’s a reminder for all students in the WMS Spring Musical — “Alice in Wonderland, Junior!” Both the TECH and STAGE readings will be held TODAY during ASP 1 and 2 in the auditorium. This will be a COMBINED REHEARSAL for EVERYONE involved with the show. See Mr. Brown for more information or with any questions. Break a leg! The WMS Jazz Band Club will be hosting its next “Jam Session”TODAY during ASP 1 in the Band Hall. All instruments are welcome! For more information, go to the Jazz Club page on the WMS website or contact the band leader, Mr. Wilkin. You’ll have a swingin’ good time! Calling all 7th grade Journalism students from the 1st semester! Don’t forget about this Friday’s “Screening Party” during lunch in the Library Classroom. But TODAY is your last chance to RSVP — if more people don’t sign-up, the event will have to be rescheduled. See Mr. Schonfeld with any questions. “I’m so glad I didn’t buy a yearbook” — Said no one EVER! The deadline to buy your 2018-2019 WMS Yearbook is February 22nd. That means you’ve got less than a MONTH to get yours before they’re all gone. Yearbooks cost 40-dollars — or for 55-dollars you can get the exclusive “Signature Package.” Just go the WMS Website to place your order TODAY — or stop by room 137 and ask Ms. Kontos and the yearbook staff for more information. The WMS Yearbook — Don’t miss out on the memories!